Winter time = restoration time ? Let’s hope so! As I wrote in our previous newsletter we’re busy with our BBT winter project! If it will be finished this very winter, we’re not sure, but the work just sails along! The dollar keeps balancing around the same currency rate for the last month, but if I look at the interest rates and considering the fact that the USA becomes every day less dependent in matters of energy supply, I strongly believe that the Euro will fall still a bit more… it could increase the price of a couple of our products. We still work in safe margins and we can absorb a lot. Let’s hope that we can keep it that way. A short review of 2014. What a lot of actions! A lot has changed within BBT. A short summary : some familiar faces left taking up new challenges and some new colleagues joined us. A service for small parcels has been introduced for meanwhile deliveries and in the meantime it’s running at full speed. The Belgian Tax Collectors Office has decided that they like to have additional taxes from BBT. We profit from the general trend of increase of value for old timers and therefore our turnover increased considerably. Let’s look forward to 2015. We plan many new products, better quality, more quantity and even a better service. The expansion of the parcel system and a thoroughly reorganization of our transport system will contribute. We’re looking forward to it. We wish you all merry Xmas and a marvelous new year’s eve with popping Champaign corks! We’ll support you wherever we can! These items already were available from our stock but from now on they will be produced under supervising of BBT. Discover the full story @ BBT's Blog? CLICK HERE to discover the article. Unfortunately for us, but so happy for him, Filip will leave his function with BBT on January 1st after 18 years of trusty loyal service. He started as a driver, later Filip was for many years the face behind the counter, until he moved through a small gap in Purchasing to the IT Publisher function inside BBT. Learned too much, without any doubt, Filip will start his own adventure specialized in social network media. Something he learned to play with at his BBT desk. We’re proud of this training with us and that we can send him out to the very wide, oh so interesting world. 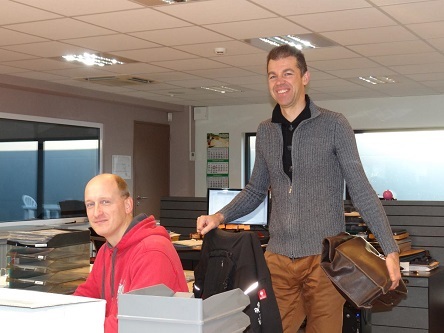 Welcome Peter, goodbye Filip, the whole BBT team wishes you both a lot of luck in your further careers…. Peter @ BBT, and Filip in his new function at Culd.be ! cy. The complete bumper guards (# 0012-650 & # 0013-650) have already been presented in a previous newsletter the moment they became available. 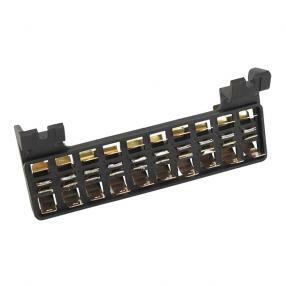 However ever since customers ask us frequently after loose parts of the American bumper guard version. 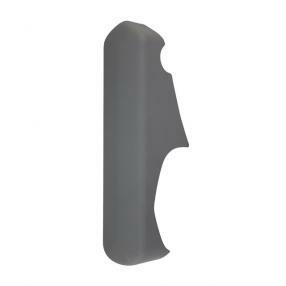 It is not always necessary to replace all parts of the bumper guard, thats why we give you now the opportunity to acquire each part separately. Available each from stock. Bad seals near the door windows can provoke that humidity penetrates into the hollow space of the door. 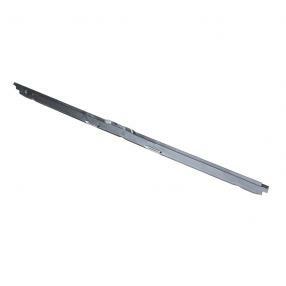 Parts that are located in the door will get damaged. Window sashes are such an example. In the past you could only exceptionally find a good second-hand window sash, because they are most of the time very corroded. BBT has them now in a nice reproduction available each from stock. This rubber strip sits between the door window and the window sash. I makes that the window is firmly gripped within the door sash. The rubber strip gets hardened after many years and the window will no longer be properly clamped within the window sash. 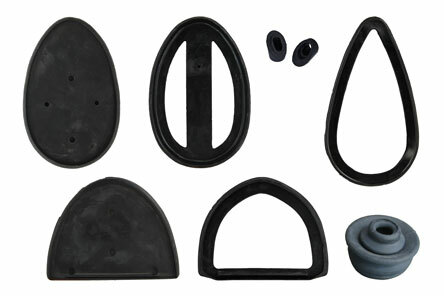 The rubber is sold each from stock. This seal will be very useful to owners of Type 2 buses when one or both side mirrors on bus doors must be installed again. Upon assembly of the side mirror without seal between mirror and body, the paint is often damaged. The result is inevitably, the body on this spot wont be protected anymore against influences of the weather and corrosion will be the result. From now on BBT delivers this seal each from stock. The distance between filler neck and fuel tank with Type 2 from model -07/71 is bridged by means of metallic parts and rubber hose. 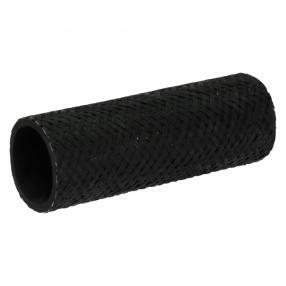 Due to influences of fuel and petrol vapors this rubber hose parts can get fragile, tear and leak. Leakage has to be avoided any way, as it has already caused fire in the engine compartment for several times in the past. 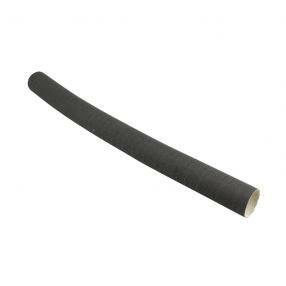 From now on we can deliver this filler neck rubber hose, which connects to the fuel tank, each from stock. The concept of the locking of front doors on Type 2 buses has been altered in the course of production. The locking on Type 2 08/72-07/79 was done from the inside by manipulating a door stop, located near the lock. 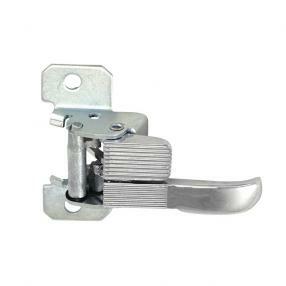 On type 2 08/68-07/72 the inner door handle was a part from this locking function. This latter function caused that the inner door handle was a rather complex unit susceptible to accelerated corrosion. Furthermore the used material was also quite expensive. The manufacturing process was simplified and got cheaper by using a different material and concept. The accelerated corrosion makes that owners of such early Type 2 buses are confronted with inner door handles that have to replaced urgently. From now on BBT has this nice reproduction of quality each for each side available from stock. BBT has laid hands on a large lot of original NOS headlight lenses of the brand Bosch, that were used on Type 2 European specification split buses from 04/60 till 07/67. Its essential to have properly working lights in the actual traffic. Often we encounter classic cars with inadequate lights. 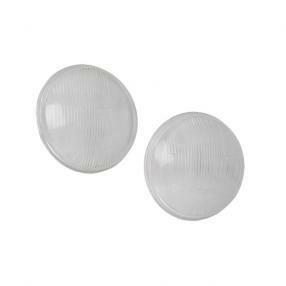 Generally its due to damaged lenses or a dull reflecting zone of the taillights. The luminous efficiency will be reduced severely. 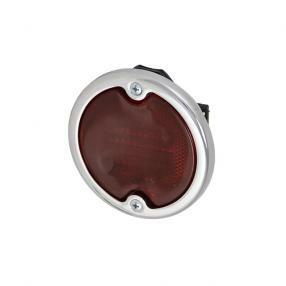 Until today we only had limited alternatives for Type 2 buses from 04/58-08/61 under the form of second-hand or NOS parts, though we have now a nice solution .with this good reproduction This taillight is delivered completely with housing foreseen of double light connection, seal, lens and chrome ring. The bulb itself is not included. The taillight is delivered each from stock. Fuse boxes have always been one of the first electrical parts that we had to recover from donor vehicles. That way we were always able to help the people looking for a fuse box. The damaged or corroded item could be easily replaced. Meanwhile our stock has been exhausted and we had to look for a suitable reproduction. It has been quickly solved for most of the types, though for Type 2a buses it wasnt an easy job, due to the fact it is a rather special version. We have been looking and found this nice reproduction, available each from stock. The cover is also available under ref. # 0662-56. A nice restoration starts with the use of good parts. BBT believes in this principal and every day we are looking for the correct material to enable restoration as it should be. These floor plates can be found on Type 1 beetle that have the seat rails executed with 3 assembly points. 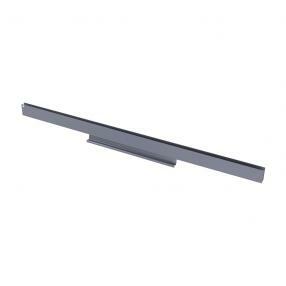 The floor plates have the correct profiles and a thickness of 1.25mm. One is no longer forced to use thin reproduction floor plates. 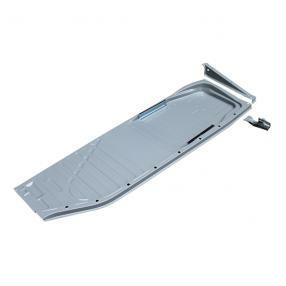 The floor plates are sold for each side and the lateral guides, jacking point and vertical rear part for connection to the body are included. 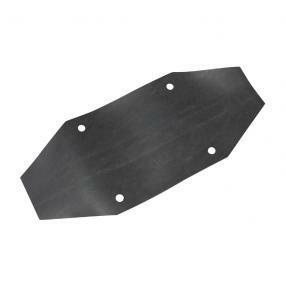 Thanks to the increasing demand we have a vast assortment of quality plating from Auto Craft. Each time a new product is brought on the market by Auto Craft, we try to enlist it as soon as possible in our assortment. The plating that we can now add to our offer is a nice piece of craftsmanship and precision. Theyve thought of each little detail. The drainage holes are beaten on the correct place and the dish is properly done. 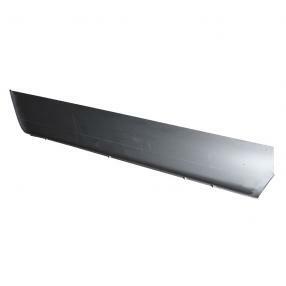 The repair of the sills with Type 2 -07/67 buses can be carried out efficiently without spending time in adjusting the plating to achieve the desired form. Available each from stock. Its surprising how many Split buses drive by our shop where the fresh air flap cover through the roof is missing. Perhaps one seeks to obtain a better cooling of the drivers cabin in warmer regions by making a large ventilation opening and one removes simply this cover. Its obvious that these covers get lost after some time. BBT delivers from now on a good reproduction cover each from stock. 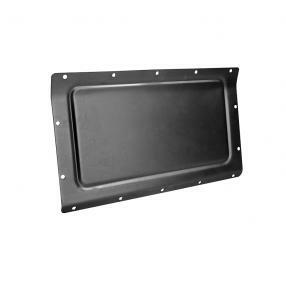 Right away when the front gills # 0891-985 produced by BBT came available, we got demands after the insect screen that is located just behind the front grill. 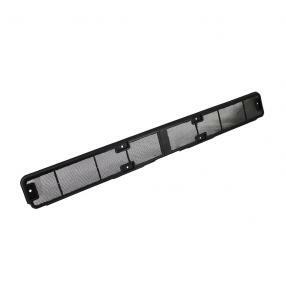 On many Type 2 buses from 08/67-07/72 this insect screen is often damaged after disassembly because they became fragile due to UV rays. BBT presents now an alternative so that you can replace the old item by a new one. Available each from stock. Youve probably read in our previous Newsletter that the BBT purchase team has been examining scrupulously the complex unit for operating the heating. 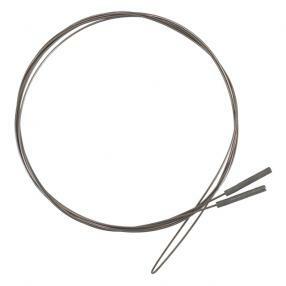 Heater cables for Type 1 beetle and Type 25 buses will be added to our assortment. 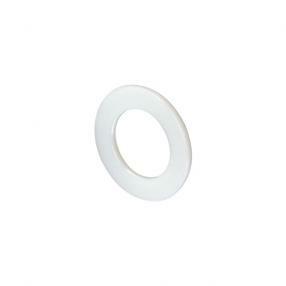 From now on you can replace without problems corroded or broken items by this new one. Available each from stock. The heated air ventilation on buses, foreseen with a Type 4 engine is contrary to Type 1 engines, actioned by an electrical blower that recovers the air taken in for the heating from the engine department and rush it through the heat exchangers into the inner compartment. The blower is located at the top of the engine compartment, from which 2 cardboard hoses lead to the heat exchangers. These cardboard hoses are very subject to wear, on the one hand due to vibrations and on the other hand to extreme fluctuations in temperature. From now on BBT can deliver these hoses as well as the correctly fitting seals each from stock. Were convinced that this piece of tool can prevent a lot of trouble for the owners of Type 25 buses, actuated by water cooled engines. The water hoses for the water cooling are fixed on these buses by means of self-clamping tube clamps. The high spring tension of these clamps assures a good sealing. For a correct assembly these clamps should be tightened in order to enlarge the opening. When releasing these clamps, they will put the cooling coil under pressure again. 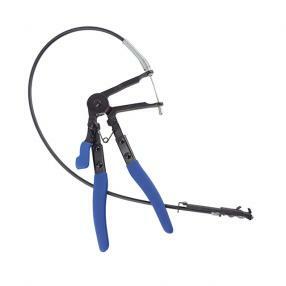 Mechanics who dont have this practical plier, will be slumping by using an universal plier or water pump plier. Beside the fact that this alternative method of working doesnt allow to reach all places, it is also a very dangerous way of work. Because the clamps are not squeezed in a correct way, they can jump away, break or cause injuries. As from now BBT has this practical tool available each from stock. A good functioning brake servo makes it much more pleasant for Type 2 Bay window bus owners whilst slowing down. By using a vacuum a part of the necessary brake force is already developed so less pressure has be put on the brake pedal. There is no vacuum when there is a leak or a cracked membrane, resulting that it will be considerably harder to gain brake power. 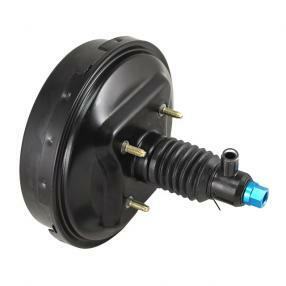 Your faulty brake servo can be replaced now by this new item and you can enjoy again driving with you classical car. Available each from stock. For many years weve been able to help the owners of oval beetles, when they were looking after brake shoes for their oval bugs. A nice solution was to cover them again. Only the metallic parts of the brake shoes had to be in a good state. Though more and more we are confronted with fans who still have the metallic parts, but they are in such a bad condition that they cant be no longer recovered. Its easy to guess the result. Our stock of second-hand alternatives was quickly exhausted, so we are very pleased that our purchase team came forward with this good alternative. 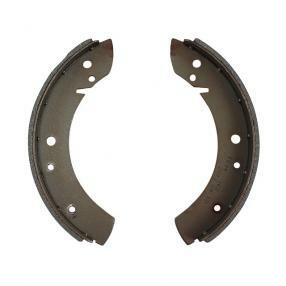 These brake shoes are sold in a set containing 4 pieces, for 1 axle from stock. Steering boxes have always been for BBT a point of particular interest. We don have to tell you the importance of good functioning steering, although it isnt an easy job to find a good replacement for a damaged steering box. Weve succeeded to present one of the parts most subject to wear. The pitman arm is activated through a steering peg that on its turn is driven by a worm wheel. When driving quite some forces are developed between the worm wheel and the peg, whereas a bad greasing accelerates wear. You can replace damaged pegs by this good reproduction. Available each from stock. Pleasant rides make or break with a good functioning of different mechanic parts of your vehicle. The shifter and transmission parts amongst other things can cause a lot of annoyance when they dont function properly. The shift rods are an indispensable part of this unit and when they are distorted some gears cant be used any longer. 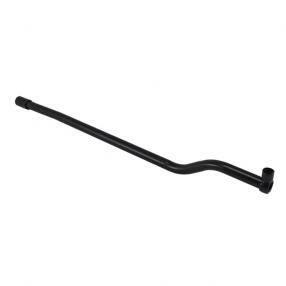 From now on BBT can help many Type 2 bus owners with the shift rods that we have taken now in stock. The shift rods are a good reproduction and are sold each. 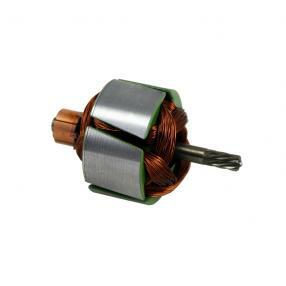 Rebuilding a 6V wiper motor to a 12V can be made pretty easy with this wiper rotor. Its easy to install the rotor. # 2474-500 is only used for Type 1 58-66 and Type 2 55-64 foreseen of a SWF wiper motor, whereas # 2474-510 can be used for none SWF wiper motors. Available each from stock. Its no extraordinary news that BBT likes to distribute Vintage Speed products. 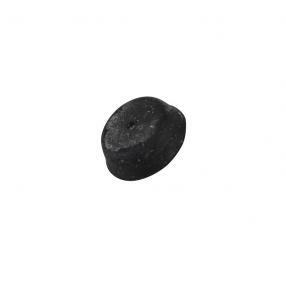 We try to offer a very wide range of products of this manufacturer. 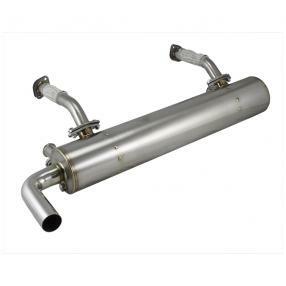 This time we make the owners of Type 3 happy with this Hi Performance Vintage Speed stainless steel exhaust The set is destined for assembly in combination with J-tubes (# 1080-820) and comes with assembly material and seals inclusive. 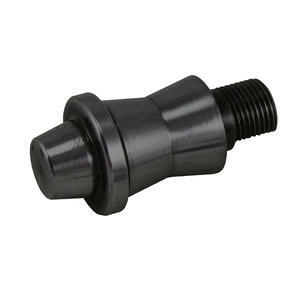 Though the seals for the connection to the cylinder heads and J-tubes are not included and are available under ref. # 1058 and # 1001. This buffer is located on Type 2 buses under the front seat frame and the body. It prevents that metallic seat parts come in touch with the body, which can cause disturbing noise and damages to the paint. Most of the time these buffers have got lost after many years. From now on BBT delivers the buffers each from stock.